Well said! I Felt a little bit of that emotion in 2012 when the Nationals did so well and had the best record in baseball. But they only had 98 winsthat year. The Red Sox accomplishment is of another order of magnitude. Congratulations, and I hope they win a few more games this weekend against the Yankees. 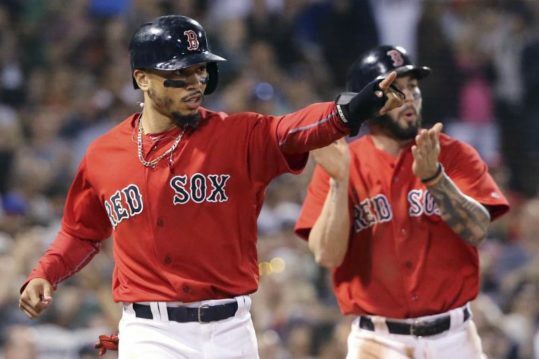 That’s the difference between the Yankees and Red Sox – it’s a failure every year if the Yanks don’t win the WS, especially if they are supposed to. Probably has much to do with the 27 titles they own, and/or the demanding attitude of The Boss (Steinbrenner, not Springsteen). Enjoy your time with grandson; since you can’t root for the Yankees please at least root against the A’s. Much better ratings will be had when the Yanks and Sox square off for the pennant. Best year evah! challenged only by the “Impossible Dream” season of 1967 when “Sox Nation” began to form and I first went to Fenway. I have a soft spot for ’75 too. These games against the Yankees could be fun if the Sox can win the first game and the A’s do their part vs Angels. The games will get intense if the Sox come close to sending the Yanks to Oakland. Not giving up on WS. Would certainly like to win it all. But unlike another Yunkee fan (Kevin above), you miss my point about the joy of a terrific long season. But then most Yankee fans are spoiled by the 27 WS wins and can’t understand some of the finer points of living (baseball). Yanks do seem to be peaking at the right time. Can both they and Oakland lose? I guess I’d like the Yankees to lose the Wild Carc game, and Oakland then lose to the Sox.